Are you having trouble sleeping? Many people struggle with sleep problems at different times in their lives and these problems can often impact our health. You may be at your wits’ end, thinking that you have tried everything to sleep better and nothing has really worked. Or you may be optimistic, believing that there are things you have not yet tried that may improve your sleep. Research into this area tells us that 50-65% of patients seeing their family doctor complain about their sleep and 10-40% have severe insomnia that interferes with their functioning during the day. Chronic sleep disturbances are often difficult to resolve without treatment and many people suffer for years without effective help. Not getting the right amount of sleep could be having more of an effect on your health than just feeling tired throughout the day. Research has shown that people with insomnia use more health care resources than those who do not suffer from sleep disturbances. Signs of insomnia vary from person to person and can include: difficulty falling asleep, waking up multiple times during the night, not feeling rested after a full night’s sleep, irritability, difficulty focusing, ongoing worries about sleep. 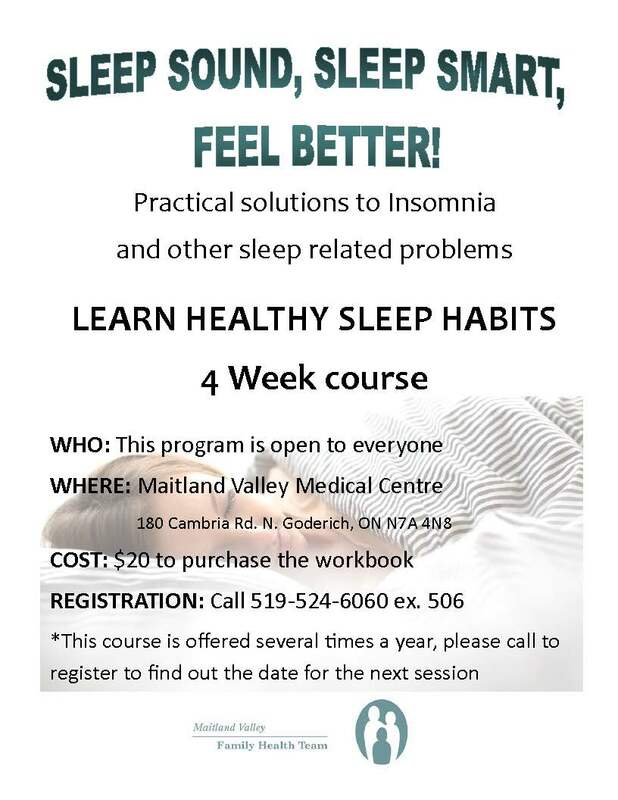 “Sleep Sound, Sleep Smart, Feel Better" is a 4 week course. The course is based on research which has shown cognitive behavioural therapy to be the most effective treatment for insomnia. The course covers topics such as keeping a sleep diary, changing bad sleep habits, solid sleep habits, health issues and sleep, and sleep medications, just to name a few. The course is a step by step guide to using cognitive behavioural therapy and stimulus control for insomnia. Individuals who have used these techniques have shown improved sleep in as little as 2-3 weeks and maintained good sleep for years. Our Social Worker, Lynne Harris, will facilitate the course and use the book “Sink Into Sleep”, by Dr. Judith Davidson, as a basis for the program to help people overcome insomnia. Dr. Davidson is a psychologist who works on a Family Health Team in Kingston and has published research on the use of the program on patients in a primary care setting. She has found significant results for those participating in her program. The sleep course will run for four weeks, held at the Maitland Valley Medical Centre. Please call 519-524-6060 ext. 506 for more information or to sign up. There is an optional cost of $25 if you would like to purchase the book.